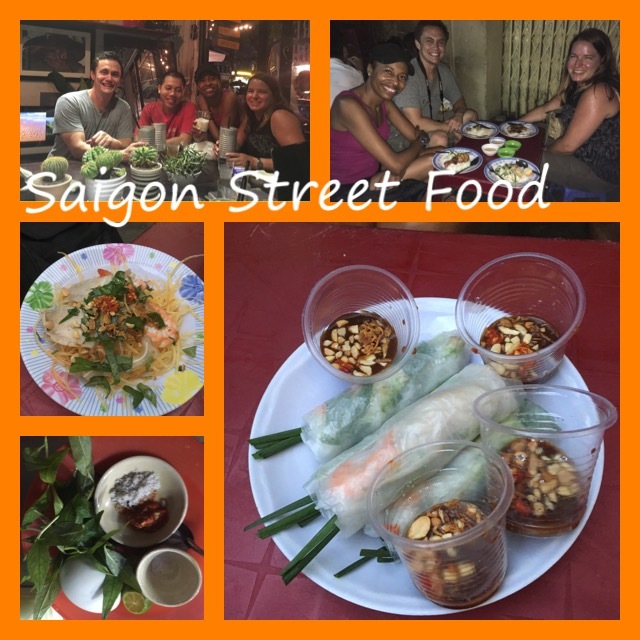 So, why do I love Saigon? Mostly, I love that Saigon has managed to integrate a Western cosmopolitan atmosphere while making it its own and still staying charmingly Vietnamese. The combination speaks to me somehow on a visceral level. Nothing specific happened, I didn’t see anything specifically to make me fall in love; it was just that as I walked around and soaked up the atmosphere, I realized I had almost immediately fallen hopelessly in love with this city. It felt like a homecoming. How’s that for unbridled, dramatic cheesiness? But it’s how I feel! The day started at 3:20 am, when the train conductor knocked on my door and said we’d be arriving in Saigon in 5 minutes. I was expecting a 5 am arrival. I had a private compartment and was in my pajamas! Yes, I panicked. I should have known by now that in Vietnam 5 minutes is not 5 minutes! So I rushed to dress, didn’t brush my teeth, wash my face, even brush my hair. Only to sit there for another 20 minutes thinking the train would come to a stop any minute. I totally had time to wash up! Oh well! I sat at the train station in Saigon until 6 (free wifi and a 24-hour Circle K, which we don’t even have in Michigan!) and then headed to my hotel, the storied Caravelle where I’ve wanted to stay practically my whole life. It’s better than I imagined, BTW. I stored my stuff and got ready for my 8 am tour. It was another private one, when I was expecting a group! 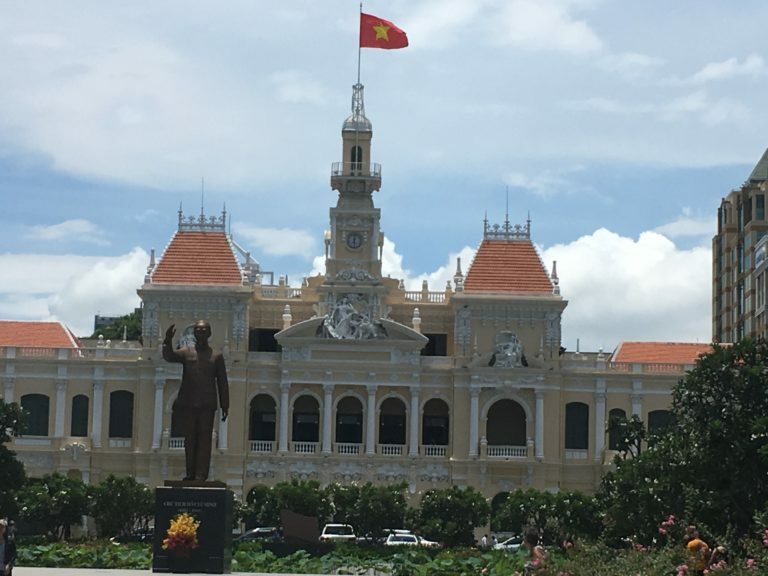 We hit the highlights of Saigon: the Central Post Office, Notre Dame Cathedral (I’ve seen them both now! 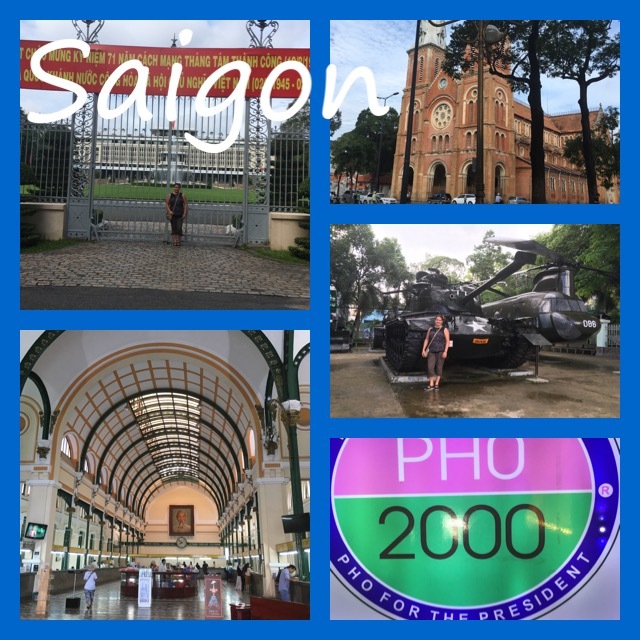 ), Reunification Palace (with a glimpse of the old Le Cercle Sportif, which is not on any tour anywhere but that I was very interested in seeing), the War Remnants Museum, and Ben Thanh Market, the oldest, most famous market in Saigon. Much better experience than Dong Ba in Hue! Of course, that was thanks to Jay, my tour guide who helped me navigate like a pro and deftly bought edible things from the market for me to try and explained the background of many of the items for sale. The War Remnants Museum was powerful, and I cried a lot. I was lucky that I had yet another stellar guide, and even though he’s only in his 20s, the war tore his grandmother and grandfather, and their family, apart, so it was powerful and humbling to hear his story and his perspective on the war and the (very obvious) political slant of the museum. During the tour, we rode in cyclos (basically a seat attached to the front of a bike) around the city , and I felt extremely touristy, but it was fun being so open and mixed in with the traffic (which is crazier than Hanoi, something I never thought possible!!!!). It was lunchtime when the tour ended, so Jay recommended I cross the street and have pho where President Clinton did in 2000. I sat down (quite accidentally) in the table one over where Clinton had eaten his big bowl of pho (which I deduced based on the picture that hung above me). Then I explored the city myself. 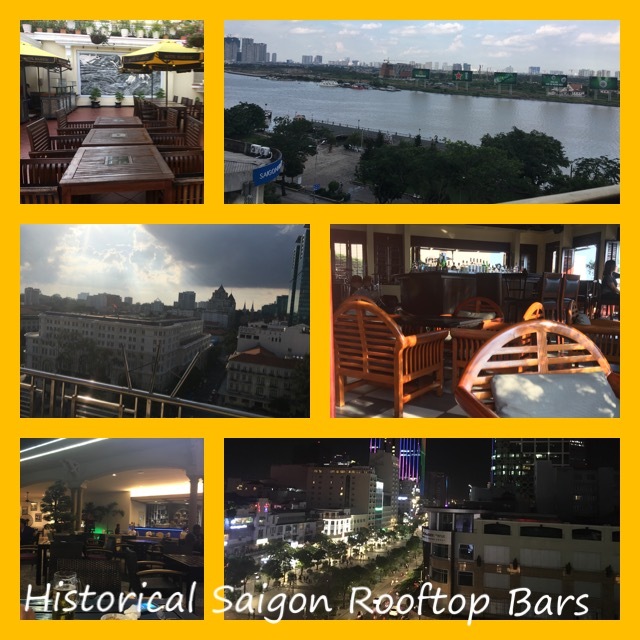 One of my must-dos was to visit the three famous rooftop bars that the war correspondents hung out at during both Indochina wars. I had time to hit two before my street food tour because I found that they were right there in front of me (not by any design by me). They were having happy hour specials, so I decided to stop in spontaneously. So cool to see a part of history and hang out at the places I’d read about so many times since high school. I also strolled by the hotel where Graham Greene wrote The Quiet American during the first Indochina (French) war. Then it was time for my street food tour. There were two other Americans on the tour! Yay! I’ve been a little tired of the private tours! All four of us, including our awesome guide, hit it off. We were all laughing together almost immediately, and as the night went on, we were laughing hysterically to the point we couldn’t talk and I had tears rolling down my face. The food tour was supposed to be three hours until 8 pm. We went to almost 10. I lost count of how many dishes we ate, but every one was phenomenal and even better than the places I’ve been finding on my own (not surprising). Every last dish was delicious. The other two Americans, John and Jan, wanted to hit some rooftop bars, so we hit the third war correspondent one I wanted to and hung out until almost midnight. They both love to travel and have been all over the world and are really intelligent and fun. It was a pretty perfect night, even when we were getting rained on. It was just a pretty perfect day. Oh, and getting back to my room and having turn-down service (with a pillow menu!!!!) and the unexpected discovery of a birthday treat from the hotel (who must have noted my birthdate on my passport at check-in) made it all the sweeter! I do need to get on the ball and start uploading, lol! Yes, it does sound awesome! Loving the vicarious tour I’m getting. When you comment about historical events you learned in school, i had to think back. We didn’t learn it as a history lesson, we learned about it on TV on the news. realizng I’m alot older than you, lol. This is a different perspective, refreshing. Glad you are having so much fun! I didn’t learn about any of this in school. I don’t even remember them covering the Vietnam War ever in school, actually. Everything I know about Vietnam is because I’ve had an interest in it since childhood (also from watching the news) and did my own reading/research. It is heaven! And lol, I believe your first thought was me getting shot up in the jungle! Sounds like you had an amazing day in an absolutely amazing city. Have I told you lately how happy I am for you that you got to take this trip and that you’re enjoying all that you get to experience? Thanks, Viv. I still have to pinch myself about that trip! « Day 13: Best. Day. Ever.